This review first appeared in the March 2009 issue of hi-end hifi magazine High Fidelity of Poland. You can also read this review of the A.R.T. 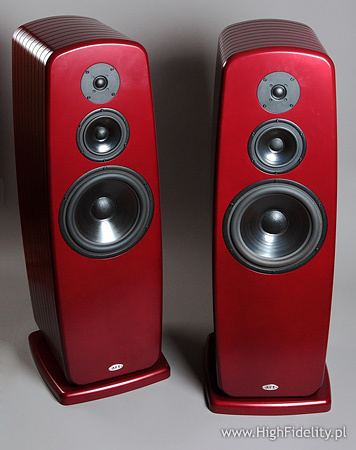 Loudspeakers Moderne 10 in its original Polish version. We publish its English translation in a mutual syndication arrangement with publisher Wojciech Pacula. As is customary for our own reviews, the writer's signature at review's end shows an e-mail address should you have questions or wish to send feedback. All images contained in this review are the property of High Fidelity. - Ed. Let me begin by explaining the A.R.T. loudspeaker's acronym. It stands for Acoustic Reproduction Technology. Any similarity to tube gear manufacturer Art Audio can't be entirely coincidental. We already had opportunity to look closer at either company to know something about them. When requesting the Moderne 10 for review, I still overlooked something key - their weight of 50kg per. The UPS delivery men had murder in their eyes and I felt similar when time came to place them on spikes and position them for listening. I had to call my son for help and recommend two people for this job, especially because these speakers are beautifully finished in any automotive lacquer of your choice. What a pity it would be to ruin that finish. saw earlier in the Greek Emme β and Mythos Ligeia loudspeakers and as it has been done for years by Italian Eventus Audio (a similar idea but running horizontally bonded plywood layers can be seen in Penaudio's Alba)*. I am talking about compression-fitted layers with internal voids creating the speaker's driver back chamber/s when stacked. But we'll stop here and not discuss this solution's originality. It is effective and serves its purpose well. The enclosures of all loudspeakers mentioned are all extremely rigid and thus less susceptible to vibration. They do have one drawback though, being far more expensive to manufacture than traditional boxes. * The new Vandersteen 7, the Magico Mini, the Gershman Acoustic Black Swan, the BPT Cirrus and the original Pioneer/TAD flagship home speaker all are/were based on similar enclosure construction methods. - Ed. The concept of the 10 as a classic three-way bass reflex floorstander with rear-firing port and its overall size are comparable to my Harpia Dobermann. What's more, the drivers are fixed in almost exactly the same places and the price is nearly identical. But differences there are too. All drivers in the Moderne 10 are soft (silk and paper) yet hard in the Dobermann (aluminum). The former runs 2nd and 3rd order filters combined, the latter 1st order networks exclusively. The Poles add mechanical phase compensation between their drivers while the Scots use a vertical baffle. The Harpia has tweeter and midrange closer to one side of the baffle whereas the A.R.T. aligns its drivers symmetrically down the middle. The most important design aspect of the Moderne 10 however is its high efficiency and an impedance optimized for low power amplifiers, ideally with 300B triodes in the output. During the Polish Audio Show 2008 I had opportunity to talk to Derek, one of the Dunlop brothers who own and design for A.R.T. The interview appeared in the December issue of Audio in the form of a group discussion between company representatives but here is a good place to summarize my questions to Derek. 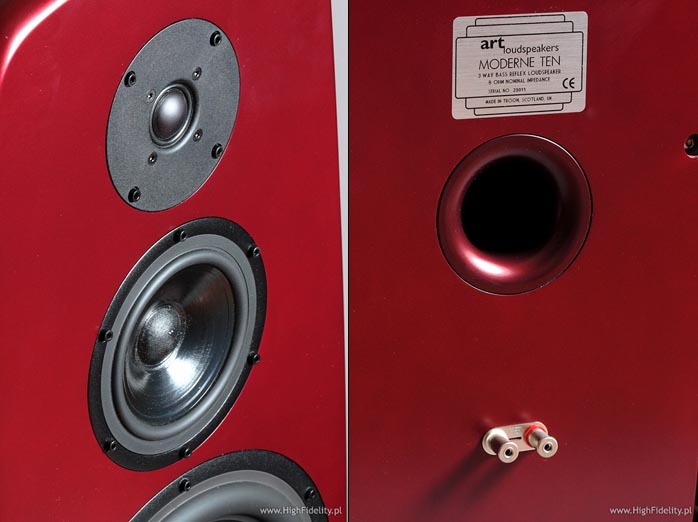 Wojciech Pacuła: A.R.T Loudspeakers are a shared enterprise between you and your brother Ramsey - are you the better half? WP: I ask everyone I talk to - is the current economic crisis a threat to audio in any way? DD: I think that in general it is not. It will touch a part of the market but those will rather be the weak companies, those less adapted. If we talk about the best companies, the best products, then those in my opinion are resistant to any market tides. Everybody will be working on that to not allow anything bad to happen. Some decisions will have to be made but in general I do think that a good product is a good product and a company can rest assured about that. If we think about luxury products like expensive cars, shoes and watches but also audio and especially expensive audio, then no recession has any influence on sales in those areas. WP: Do you think that Blu-ray will be a success or is it a lost format from the very onset? DD: (loud puff from his mouth) This depends solely on the big companies and how determined they are. From the consumer's point of view, there are too many formats already, too many possibilities to feel lost. People want to be left alone and have clear rules. Those two collide so who will be the winner? Nobody knows. WP: What is your favored format? DD: Vinyl of course. Two channels. In these days dominated by digital signal, a good system based on the vinyl disc still sounds more natural and plain better than even the best digital players. That's why I still buy vinyl. WP: Is there no chance that high resolution downloads to hard disk will bring those two worlds together? DD: Of course they will! Good digital sources are getting better and the Internet is a splendid portal to make them available. But I think that well recorded music from a well prepared analog disc is still closer to what we hear around ourselves. WP: Do you think that we'll see new technology appear that can change some part of the audio business or will we continue with what our ancestors came up with? DD: I think that not much has changed over man, many years and that nothing will change either. Please look at our system. We use amplifiers with single Western Electric power tubes, we use dynamic speakers etc. There is nothing new on the horizon. WP: Don't you think that a kind of anachronism? DD: No, no, this is the best way of expressing what was recorded by the artist as I see it and deal with recordings. If we want to be honest about what we do, the only question in this situation really is whether the sound is credible, whether we can believe it to be a real event. WP: Your new Decco series has different enclosures from the classic models. Is this just a design feature? 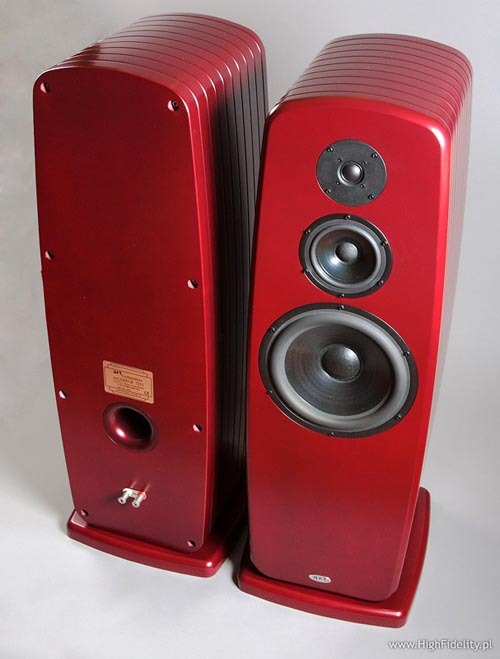 I will merely add that we tested the model A.R.T Loudspeakers Stiletto 6 here. Beverly Kenney, Lonely And Blue, Cellar Door Records/Sinatra Society of Japan, XQAM-1-22, CD. King Crimson, In The Court Of The Crimson King, Universal Music Japan, UICE-9051, HDCD. Solveig Sletthajell, Silver, ACT Vision+Music, ACT 9715-2, CD. Pink Floyd, Wish You Were Here, EMI, 529071, CD. Lee Morgan, Introducing Lee Morgan, Savoy Jazz/Columbia Music Entertainment, COCB-53767, HQCD. Kraftwerk, Minimum-Maximum, EMI, 349962, 2 x SACD/CD. Led Zeppelin, Led Zeppelin, Atlantic/Warner Music, WPCR-11611, CD. Yes, Fragile, Atlantic/Mobile Fidelity, UDCD 766, gold-CD. Jonas Knutsson+Johan Norberg, Skaren: Norrland III, ACT Vision+Music, ACT 9474-2, CD. Woong San, Feel Like Making Love, Pony Canyon Korea, PCCY-50014, HQCDE. I was very curious to hear how the 10 would sound so right after unpacking, I listened to two discs the same evening - Pink Floyd's Wish You Were Here and King Crimson's In The Court of The Crimson King, oldies but absolute classics; and, this was also important, fitting the evening mood. I immediately knew these to be completely different speakers than the Dobermann or Xavian Giulia I had on parallel assignment. Completely different. After listening to those two discs, I knew that although this review ventured in a different direction, it would be a classy hi-end one. If I had to compare the sound, it would be to Avantgarde Acoustic's Uno Nano. Why hi-end? What hi-end is and isn't has been endlessly discussed but we still lack a clear definition. Each listener has his own ideas about which product is hi-end and which is not. With speakers like the Moderne 10, there is no such dilemma because it sits not at the entry of this group but comfortably in the middle. How so? First off, the sound is very credible. We do not call upon this often but it is the basis of making our body, head and all the rest assume at least for a short while that what happens in front of us is the real thing. A thorough replication of the live event is not possible and we should not count on succeeding some day but hi-end products with all their mechanical and technological flaws and limitations can present something such that it makes us forget ourselves to simply listen to the music. This is a very uncertain criterium of course since it depends much on the perception and sensibility of the listener. Some will pass out with budget NAD, others with top Jadis. So we have to assume that the listener is educated in this area and knows what he listens to and what she hears. Credibility then. I think that the Dunlop brothers succeeded in funneling the spirit of music into their loudspeakers. Despite that fact -- and I will repeat this because it's important -- these are completely different transducers than the ones I chose for my system.